Our Liquid Waste Program protects the public from direct exposure to contaminated wastewater, promotes the proper treatment and disposal of all sewage, and prevents the pollution of surface and groundwater. The department of Environmental Health oversees the design, construction, and installation of all on-site wastewater treatment systems and wastewater holding tanks. It is responsible for the businesses and vehicles contracted to clean septic tanks, portable toilets, and wastewater holding tanks, and ensures that all on-site wastewater processing and/or treatment facilities are following the proper steps and procedures. There are approximately 25 million American homes that rely on septic systems, as well as many commercial establishments in suburban and rural areas. Septic systems are a simple, cost-effective, and environmentally friendly way to treat wastewater from your household or business. The most frequently installed system is the standard pit system. 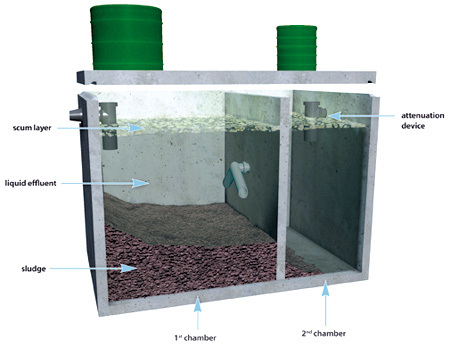 This type of system is used in areas where it has been determined that the system would be less likely to degrade groundwater quality, and the soil conditions are such that effluent will be more readily absorbed into the pit area. If your parcel is in an area where the water table is high, or soil conditions are poor, a shallow leach field (preferred in Plumas County) or deep trench type disposal field may be required. There are situations that prevent the installation of the standard system. In the event that a standard system cannot be installed, there is an engineered or alternative system, which is designed and (in addition to the Environmental Health Specialist) inspected by a registered professional. Registered professionals include Registered Environmental Health Specialists, Civil Engineers, or professional Geologists. For a current listing of local Specialists and Professionals please click here. Regardless of the type of system, it is important that you follow the step by step procedure in order to complete the installation in the time frame that is allotted to the sewage disposal permit. Each application is given one (1) year from the date that the permit is issued to complete the installation process. If you are unable to complete the project, there is a one (1) time only extension. If the system is not inspected and completed at the end of the extension, you will have to begin the application process over again and pay new fees. 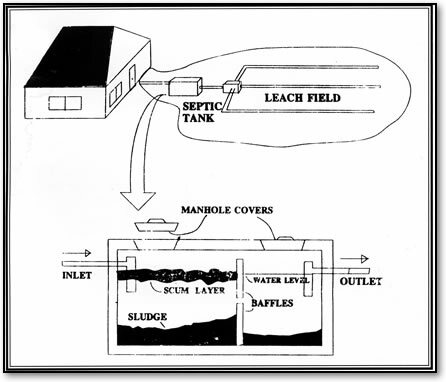 The two major parts of a septic system are the septic tank and the leach field. Leach field: The septic drain field or leach field is used to remove contaminants and impurities from the liquid that emerges from the septic tank. It is where the effluent enters a distribution box, which evenly distributes the flow to perforated pipes known as leach lines, in the absorption field. The soil then acts to filter and purify the effluent. It is essential to maintain and care for your septic system. A failed system is a big deal and poses serious health risks, as well as environmental hazards. Not to mention that it is extremely expensive to replace. Owners can protect themselves from premature failure by following simple daily care, routine maintenance, and by knowing what to look for when there are signs of trouble.